Telenor conducted an interesting survey among the netizens across India, Thailand, Singapore and Malaysia, about the internet habits of people. The telecom service provider has found that 65 percent agrees themselves as internet addicts. 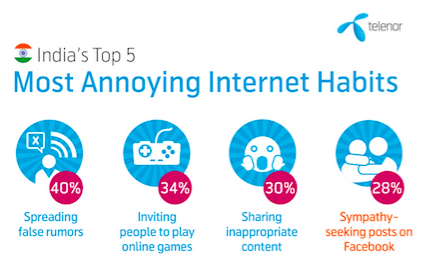 Among the most irritating internet habits, 40 percent people find spreading false rumors as annoying and 34 percent people find inviting to play online games as frustrating. Sharing inappropriate contents, sympathy seeking posts on Facebook and trolling/offensive or provocative posts to elicit angry responses are also counted as annoying. In India, selfies are rated as the highest irritation, with 33 percent finding it as annoying against the regional average of 21 percent. Indian also admit themselves to be guilty of Facebook voyeurism (looking but not posting) and sending e-Cards, at a shared 23 percent. Indians also said that they post food photographs often and send online game invites. “This survey gives us a very stimulating way to look at who are our customers are and their online preferences. As online access increases in the country, it is great to see that 94 percent of the Indians surveyed say that Internet has improved their lives – the highest percentage among the surveyed nations. As technology evolves, so do our people and our cyber interactions. I think that Indian people are aware of their online behavior and want to make sure that the net remains an inclusive and regulated domain,” says Sharad Mehrotra, CEO, Telenor India. Other indications of the study say that females spend more time online than men. 21 percent of the females spend two hours per day online, which will equate to 730 hours per year. Men access e-mails more regularly than females, with 89% accessing it ‘many times a day outside of work purposes’. Among the internet addicts, around 94 percent of the people admit that the internet has improved their lives. 83 percent also finds that the internet has strengthened the bond between the friends and family. As a way to solve the internet addiction, 20 percent Indians feel government-run education programs should be utilized to improve Internet etiquette – much higher than the regional average of 12 percent. 27 percent people feel that parents can talk to children about this. “With Telenor’s strategy of Internet for All and goal of achieving 200 million active internet users by 2017, we will see many first-time internet users in Asia over the coming years. As more people access the internet it will be interesting to see how netiquette evolves, just as the world does. As for selfies and cat pictures – I would not be surprised if the next billion people connected turn out to be more sophisticated than us!” added Karianne Melleby, VP Head of Global Partnerships, Telenor Digital AS. Use of internet with telenor is most irritating thing that is what I say.!!!!! !